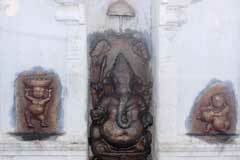 Lord Vinayaka in the temple is on a Lotus seat with an umbrella above Him and two fans called Samaram. 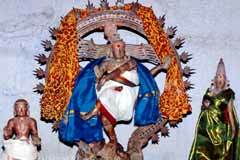 Lord Muruga, against the tradition of facing East, is seen facing the South, a direction attributed to Guru. 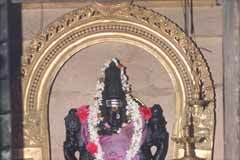 Lord Muruga is revered as Jupiter-Dakshinamurthy in this temple. 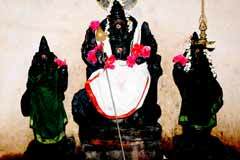 He graces with His consorts Valli and Deivanai. 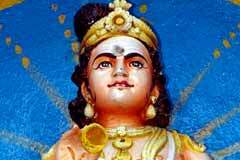 Special pujas are performed in His shrine on Thursdays, a day attributed to Guru. There are shrines for Mother Durga with eight hands and Sattainathar. There is no shrine for Navagrahas – the 9 planets. 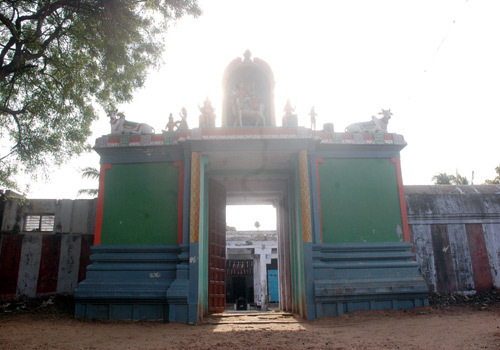 During his pilgrimage, Saivite Saint Sundarar came to this place to worship Shiva, but could not find the temple as the place was a dense jungle then. He sadly continued his journey with his followers. When he felt very hungry, an old man came to him and said that he was feeding Shiva devotees at a nearby place and asked him to come there for a lunch. Sundarar and his followers enjoyed a good feast coupled with hospitality of the host. After the lunch, Sundarar slept for a while as he was very tired then. When he woke up, he found neither the feeding camp nor any sign of feeding event. He realized that it was Lord Shiva who quenched his hunger. 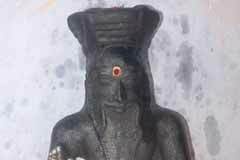 Lord Shiva appeared before Sundarar and showed him the temple. This Feeding event is celebrated as a great festival on the Full Moon Day of the month of Chithirai (April-May) in the temple. 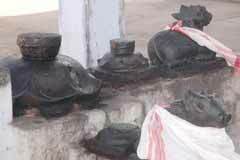 Devotees believe that worshipping the Lord here would ensure them a life free of hunger. As was agreed between Sambandar and the Jains, the latter were hanged after Sambandar won every challenge. However, Sambandar had to incur the sin of causing the death of the Jains and wanted to go to Kasi to make amends for the sin. 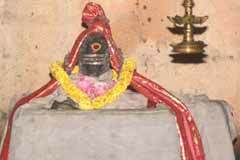 He prayed for the permission of Lord Shiva in Sirkali to proceed to Kasi. 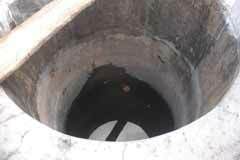 Lord appeared before Sambandar and brought Ganga here itself. The child saint had a dip in holy Ganga and got relieved of the sin. A temple was erected here later. Tirukaruhavur is 5 kms far from Sirkali. Bus facilities are not convenient. The devotee has to get down at the Vadakal stop from Sirkali and can reach the temple from there at a distance of one kilometer. Auto facility is available.